I’m watching Wall-e tonight but before I post about that masterpiece let’s talk about the great animated short Presto. 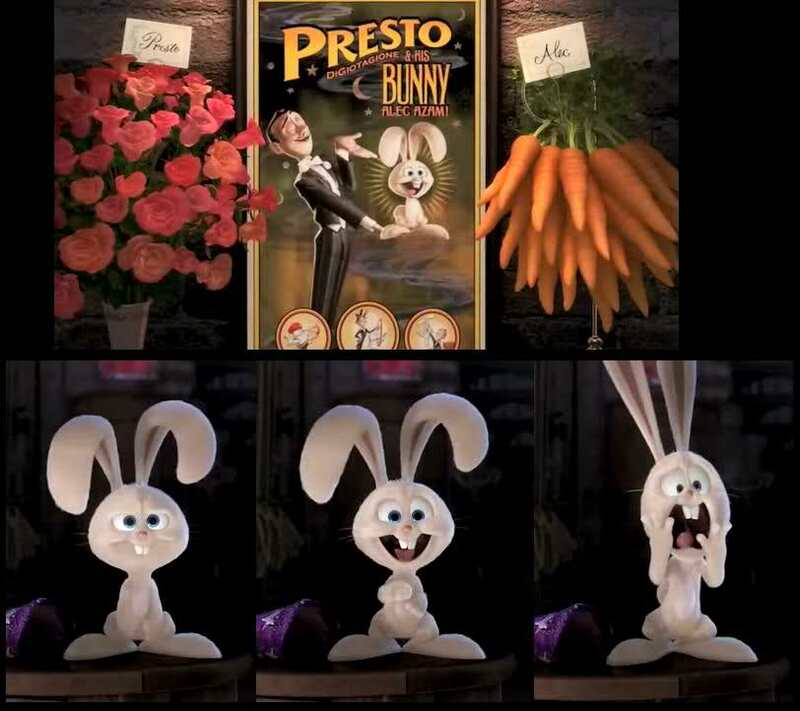 If you haven’t seen it I think it is one of Pixar’s funniest shorts with some terrific character design. As most of the shorts are this is pretty simple and it does repeat the same gag over again but each time it gets bigger and more humorous. It has the feel of an old Looney Tunes or Tom and Jerry short. 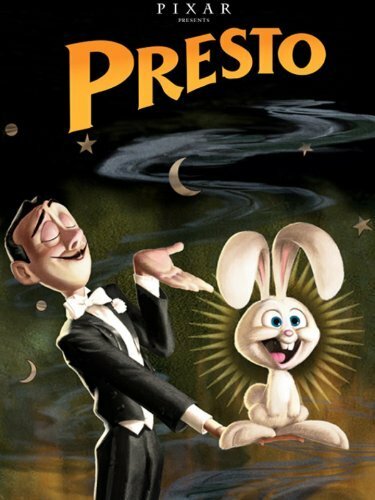 It’s about a magician named Presto and his hungry and rather grumpy rabbit named Alec Azam. The design of the rabbit feels particularly old school and I think it is very charming. 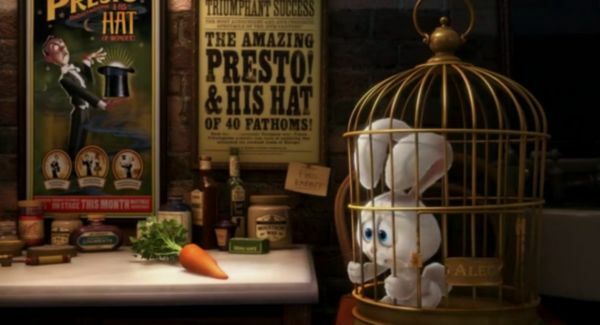 So basically the story is Presto has a real ‘magic trick’ where 2 hats are connected. Whatever you put in one comes out the other. This gif kind of shows how it works. 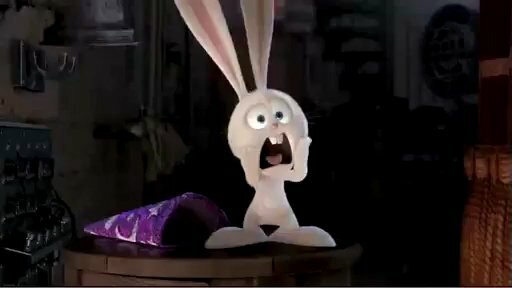 At the beginning the rabbit, Alec, is in a cage and he wants the carrots but in his rush Presto forgets and rushes to the perform. This makes Alec very upset. 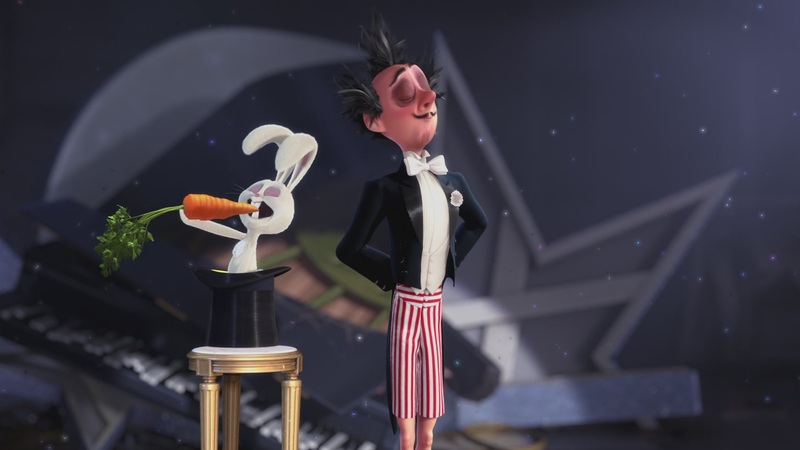 Alec tries to tell Presto that he needs the carrot in order to participate in the magic show but he refuses making Alec angry and out for revenge. Alec even worries he is going to lose the carrot for good! 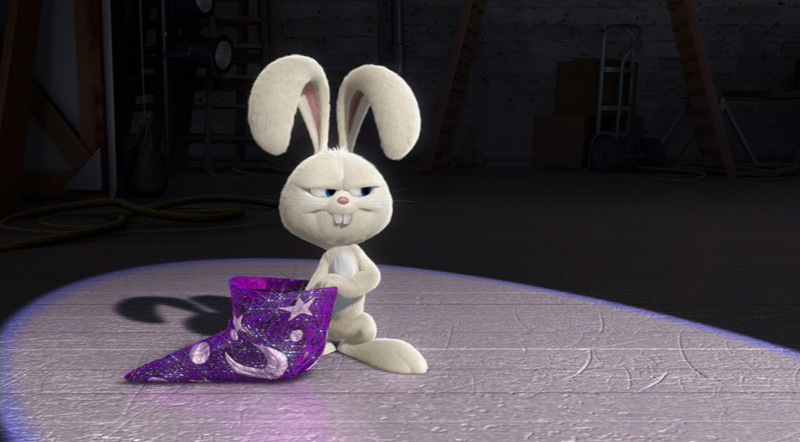 I love this expression! 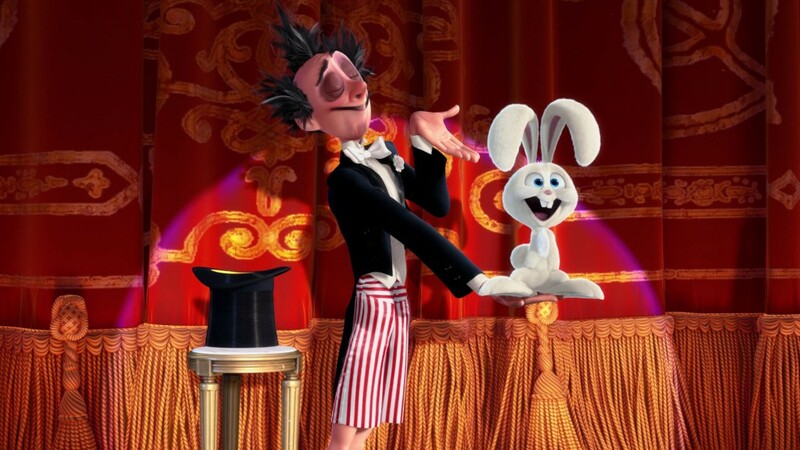 That’s when instead of jumping in the hat like he is supposed to Alec uses the hat’s magic to send things out of the other hat to strike Presto. 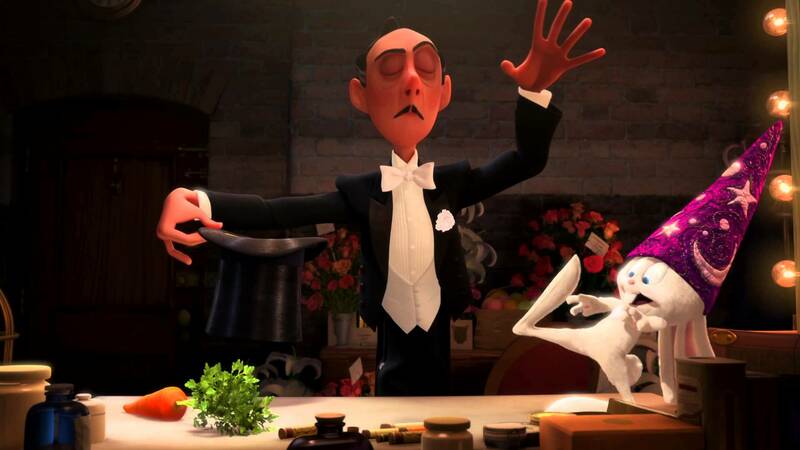 It is very funny with everything from a piano to eggs hitting the magician. Meanwhile the crowd is thrilled with the crazy trick Presto is doing. I mean wouldn’t you be if you saw such things flying out of a hat! They give Presto and Alec a huge round of applause and even though he is weary Presto is thrilled with the response (as any performer would be). And of course in the end Alec gets his carrot. Like I said, this short feels very old school like something you would see in Looney Tunes or Tom and Jerry and I like that. It escalates the madcap antics just enough to produce a laugh at each level (you couldn’t go from a mousetrap to electric shocks. It needs to be gradual). 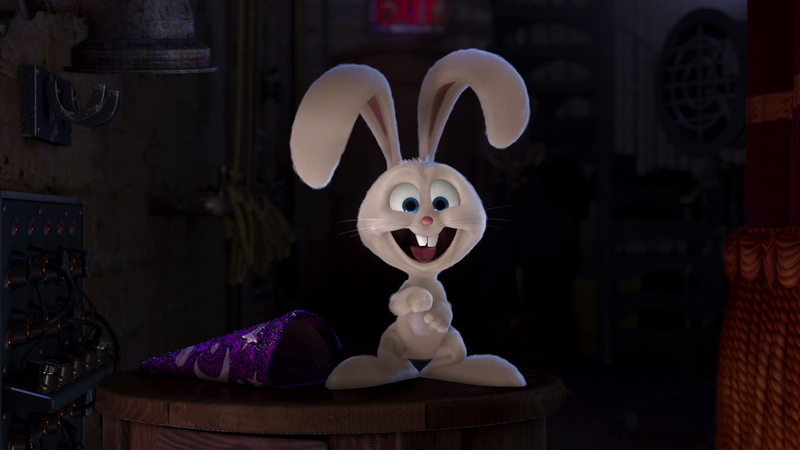 I also love the design of Alec, the rabbit. He is so cute and expressive with his eyes and face! Presto is also bright, colorful, with great music that fits the old fashioned feel by Scot Blackwell Stafford. It was veteran Pixar man Doug Sweetland’s directorial debut and he used Tex Avery cartoons as his guide and you can feel that influence . All in all it is one of my favorite comedic Pixar shorts. I think this one isn’t as well known as the other shorts. I think you might be right. I had forgotten about it till this viewing. It’s really funny. I’d like to use this short to return to your comment on me disliking slapstick comedy. I think I mentioned this before, but my aunt always vehemently hated violence in media. She said that she thought the only way to watch Home Alone was to get rid of any idea in your mind that the injuries are happening to real people. She said when looking at old Looney Tunes cartoons from her youth she was surprised at how violent they were and suggested it made sense when you considered they were the product of the WWII and post-World War II entering Korea period.